There can be a high price to be paid for doing nothing. So it is for OPEC. In this case, doing nothing is described as "closely monitoring developments". Meeting last Friday in Vienna, its failure to agree on a strategy to steer the oil price back up has resulted in the price per barrel falling. Monday's decline was more than 5%. Another 1% down took the price of a barrel of Brent crude below $40 for a few minutes on Tuesday. Wednesday has seen it rising a bit, to $40.66 as I write. Some of this may be traders taking short positions - gambling the price would fall - and now taking their profits. Yet the downward trend may not have finished yet. So, good news at the forecourt, where sub-£1 litres may soon become common. Not so good if your economy depends on oil and gas jobs. Eighteen months ago, the North Sea benchmark - used around the world, except for North American output - was at $115. It had fallen below $80 by the time the Organisation of Petroleum Exporting Countries met in November last year. At that point, its leading and dominant producer, Saudi Arabia, made clear that it had no intention of propping up the price by cutting production, only to let upstart American shale-frackers grab a piece of OPEC's market share. The Americans were to be pushed out of business. The strategy hasn't worked that well. It turns out US unconventional oil and gas production is more resilient, at a lower price, than the Saudis and others had predicted. Break-even for the new Texas and Dakota wells is higher than current prices (US West Texas Intermediate is below $37.50). So there is some expectation that supply from that American source will fall away in the next few months, as fracked wells lose pressure. But given the technology, it takes not much time to crank it back up again - once the price rises. Will it do so? History tells us it should. It's a volatile market. Oil companies have pulled back harshly on their exploration and investment plans. That points to a fall in supply by the end of this decade. And that, of course, would make the price rise again. But there are many other factors at play in deciding where the oil price will go in the shorter term. One is demand. The economic slow-down in China is seen as a key contributor to falling markets - not only for oil, but moreso for other raw material commodities. However, the Chinese have been buying oil to put into storage, and they are expected to continue doing so into next year. Stocks of oil are high around the world, and one concern raised by market analysts is that storage capacity is running short. If so, traders will have to offload tanker-loads into the market at whatever price they can get - meaning that price would get lower still. On the supply side of the oil market, OPEC has found its sacrificial leadership is being undermined by non-members and by a lack of discipline in the ranks. We've come a long way from 1973, when OPEC turned the taps off and let the world know of its power. The sourcing of oil is now much more diverse. Back then, OPEC reached its peak influence, with more than half of world production. It reached its lowest point with falling prices in 1985, at 30% of output. Last year, it was on the slide again, as fracked hydrocarbons gained share, and OPEC had only 32% of output. OPEC's 13 members - the Persian Gulf, Libya, Algeria, Nigeria, Venezuela, Ecuador and Indonesia - look much more powerful when measured by their 81% of the world's known oil reserves. The US has been joined by Russia as non-members upping production and upsetting OPEC's calculations. Iraq is rebuilding its oil industry and has bills to pay, for its infrastructure and for the war it is fighting with "so-called Islamic State". Iran has been shut out of export markets by sanctions. But the deal struck with US-led diplomatic endeavours earlier this year should allow it to resume sales some time in 2016. Tehran is making clear that it has no intention of taking its instructions from the Saudis on how much it can sell and earn. Tensions have been rising between these two countries. And under the rule of a new generation of royals, Saudi is being more assertive and less predictable. It becomes more unpredictable still as the Riyadh government burns through its vast financial reserves in order to sustain the country's bloated, low-tax lifestyle. The IMF is predicting a budget deficit of nearly 20% this year. (If that were in the UK, it would be more than £300bn in one year). The House of Saud could afford to keep going at that level for around five years, but there will be political as well as financial tensions at work if it does so. Other OPEC members, reliant on oil tax receipts to pay government bills, are in even deeper trouble. Libya has both the lower price and a civil war hitting production. Its government deficit is thought to be more than half of all its output this year. Amidst all this, the immensely complicated conflicts in Syria and across its border with Iraq could blow tear gas into the oil markets, disrupting even further, yet also pushing combatants to maximise oil sales to fund their war efforts. And it's hard to find anyone who thinks that the climate change summit summit in Paris will make much difference to the market for the dirty black stuff. There is a campaign to keep the oil in the ground, as part of the effort to constrain average temperature rises. 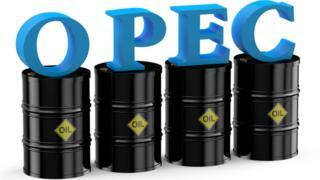 But while prices have dropped, OPEC production has increased from 30 million barrels per day to more than 31 million. Indonesia has re-joined the cartel, and as that figure doesn't include the contribution from Iran, it seems the 30 million barrel target has become worthless and irrelevant. Could OPEC follow suit? Closer to home, the UK has been producing 1.4 million to 1.5 million barrels per day (or the gas equivalent). Unlike those whose wells are in the desert, it's not viable to switch off offshore production while prices are low. Output should be about to go up, as Total starts pumping gas from its long-delayed Laggan-Tormore field, west of Shetland. But the word from Oil and Gas UK is that there is now a "sustained fear" that prices will stay low for a long time. One of the trade body's senior managers told BBC radio on Wednesday that fields are losing money at current prices, and some aren't even covering their production costs. The consequence, says, Mike Tholen, will be fewer fields producing by the end of 2016. And with exploration all but dried up, there won't be fields to replace them.